Breakfast, lunch and dinner are served via open seating at one of the two traditional restaurants -- Indigo or Summer Palace -- but many passengers take advantage of the Garden Cafe and Great Outdoors Cafe when the weather is good. Pearl's two main dining rooms offer up the same menu but with different decor, so you feel like you are dining in two distinctly different venues. Dining times vary; a main dining venue might be closed for service due to the needs of the current voyage (on theme cruises, for instance, one restaurant might be used for autograph sessions on a certain day, while the other remains open for lunch). There's also a Continental breakfast occasionally served in Bar City (an area with multiple drinking establishments on Deck 6), with rolls, croissants, juice, coffee, tea, bagels, cream cheese and smoked salmon. The bars aren't open at that hour, so it's a quiet, pleasant place to have a morning meal. Complimentary late-night food options start around 10 p.m. and are available in four areas: Bar City (right outside of Le Bistro), Pearl Club Casino, Great Outdoors Cafe and O'Sheehan's. Both Bar City and the casino usually offer one main finger food (egg rolls, steak skewers) followed by assorted fruit, cookies and sandwiches. Great Outdoors takes it up a notch with hot entrees, soups, salads and bacon and eggs for partygoers until about 3 a.m. O'Sheehan's is open 24/7, offering pub food like chicken potpie or Buffalo wings to soak up the suds or satisfy that midnight munchie. Summer Palace (Deck 6, aft): Summer Palace is only accessible by walking down a short staircase at the back of the ship to Deck 6. The restaurant features a stunning array of red and green upholstery, marble columns and large windows at the aft. Paintings that line the walls depict what seems like young royalty "summering" at a fancy estate. The menus in both main dining rooms are the same, and most selections change nightly. Categories include starters, featured dishes, a la carte, main courses and desserts. Choose from bouillabaisse soup, or shrimp mojito ceviche; then move on to flounder Milanese, sirloin strip steak or vegetarian lasagna. There are three a la carte options offered nightly consisting of premium dishes that incur an additional charge; the surf and turf with lobster and filet mignon, for instance, is $24.99. Local flavors are worked into the menu with items like a Bahamian fish and crab cake on our sailing to Freeport. Dishes marked with a check are healthy options, and vegetarian options are available, along with other dietary accommodations, arranged upon request. A sugar-free dessert is available at every meal. Besides an array of ice cream, pies and the like, both dining rooms also offer specialty Lavazza Italian coffee, available at an additional charge. A kids menu includes chicken fingers and grilled cheese. The Main dining room breakfast menu offers up made-to-order hot and cold options like omelets, cereal, pastries, fresh fruit, French toast, bagels and lox and eggs Benedict. Typical hours for breakfast, lunch and dinner are 7 to 9 a.m., noon to 2 p.m. and 5 to 9 p.m., respectively. Indigo (Deck 6, midship): Indigo, the smaller of the two main dining rooms, fittingly features a blue and purple color scheme with flashy, multicolored paintings of American landmarks like the Statue of Liberty and the Hollywood sign. Indigo is usually open for breakfast, lunch and dinner, but dinner is served a bit later here than in Summer Palace (5:30 to 10 p.m.). Garden Cafe (Deck 12): Rather than a buffet,the Garden Cafe is a restaurant with rows of "action stations." Servers stand behind the counters, where small amounts of freshly made meals are put out one at one time and served. There are stations for salads, sandwiches, fresh pasta, carved meats, soups and vegetarian dishes, Asian and Indian food, hot dogs, hamburgers and attractive desserts displayed in glass cases. While there is tons of seating, stations do crowd frequently and you might have to walk back a bit before finding an open table for your party. Hard ice cream with toppings is available much of the day, either in cones or in bowls. Breakfast has everything you would expect from a buffet: sausages, bacon, eggs, cooked vegetables like mushrooms and onions, pancakes, fruit, small boxes of cereal, even Indian curries. Great Outdoors Cafe (Deck 12, aft): This aft deck dining venue offers an alfresco version of the buffet with similar but more limited food options. The outdoor buffet is typically less crowded, so it's a nice alternative at peak dining times (when weather permits). Topsiders Bar & Grill (Deck 12): A well-stocked pool grill, open from noon to 3 p.m., serves roasted chicken, hamburgers, hot dogs, salads and dessert items buffet-style. It also serves limited breakfast (fruit, pastries) in the mornings. On some cruises, crew put together a cookout in front of the pool grill, with items like jerk chicken and corn on the cob. Lotus Garden (Deck 7): This complimentary Asian venue offers dinner nightly and lunch on sea days. Choose from appetizers like pork pot stickers, spring rolls, a wakame seaweed salad with sesame dressing or egg drop soup. Main courses include Kung Pao chicken, orange peel beef, lemon pepper shrimp and fried rice various ways. A lobster Cantonese or ginger steamed Chilean sea bass are available for an additional charge at dinner. Dessert options include a five spice chocolate cake, coconut tapioca or crispy chestnut and red bean triangles, which reminded us a lot of baklava (and came with green tea ice cream). The meal was well prepared – and it didn't hurt that it didn't cost us anything extra; had we been on a longer sailing, we'd likely have gone back again. O'Sheehan's Neighborhood Bar & Grill (Deck 8): O'Sheehan's175 is Norwegian's fleetwide pub; it's located one deck above the atrium on Pearl, encircling the space so there's a view below from nearly anywhere. The area never closes, and has everything from table service with a rotating menu (breakfast, lunch, dinner, late-night) and a small buffet to a bar in the back, overlooking the atrium. (While O'Sheehan's has more of a pub vibe on Norwegian's newer ships, its retrofit on Pearl put the bar area out of the way and, subsequently, it's not very popular.) O'Sheehan's was our secret weapon for breakfast -- never crowded and providing made-to-order omelets, French toast, baskets of pastries and, most importantly, lots of coffee. Whether you want a slice of chocolate cake or a plate of fries, this is the spot to indulge your caloric whim. Have a night out at one of Norwegian's specialty dining restaurants, which span French, Italian, Brazilian, Chinese, Japanese and American cuisines. While most menus charge per item (like land-based restaurants), two venues -- Teppanyaki and Moderno -- carry flat cover charges. If you plan on making it a "night out" every night, specialty dining packages bundle the cost of multiple meals at specialty restaurants into one flat fee, reducing the overall cost. Specialty restaurants on Pearl are typically open for dinner from 5:30 to 10 p.m. Le Bistro (Deck 6); a la carte pricing: French restaurant Le Bistro has an upscale Art Nouveau setting, and serves dishes like escargot as an appetizer (most apps cost about $5.99) and duck confit and grilled swordfish as mains (entrees range from $12.99 to $34.99). The chocolate Napoleon is the dessert highlight here -- most desserts are priced at $5.99. Sushi Bar (Deck 7); a la carte pricing: Adjacent to Lotus Garden is a sushi bar, open for lunch on sea days and nightly for dinner. While sushi rolls and sashimi are also available to order on the Lotus Garden menu, the bar allows for a more authentic feel, as you watch the sushi chefs create your order. Rolls with names like Ten Shades of Grey Roll or Two-Timing Tuna Roll range from $5 to $7.50. Nigiri (raw fish over rice) is $3.95 and an order of sashimi (raw fish) is $5.95. Teppanyaki (Deck 7); $29.99: Teppanyaki is Norwegian's popular Japanese Hibachi restaurant where the preparation of your food is a show. Skillful and playful chefs balance eggs on the back of spatulas and flip and catch shrimp, all while serving you a three-course meal. Highlights include the hibachi chicken with udon noodles and an exotic green tea cake for dessert. Fair warning though: There are only four tables (with about eight to 10 seats at each) in this small restaurant, so you need a reservation. Moderno Churrascaria (Deck 13); $24.95: Moderno Churrascaria, a Brazilian-style steakhouse, offers an expansive lineup of skewered meat, including lamb chops, filet mignon and Portuguese sausage. A mural of people dancing and dining lines the walls and the dim lighting creates an elegant feel. The meal begins with a quality salad bar that features international cheeses, dried meats, olives and marinated veggies like grilled bell peppers alongside the traditional salad ingredients. The pre-made salad options -- like the yellow beet with chicken and mango; or the shrimp, scallop and red snapper ceviche -- are also exquisite. For your main course, there's no need to choose just one; waiters come around with meat on skewers, and you can try small portions of everything. Sides, including mashed potatoes, fried sweet bananas, and rice and beans, are served with the meat. Beware: It's very easy to fill up on starters before the meat is brought around. Pace yourself. La Cucina (Deck 12); a la carte pricing: Large, family-style wooden tables hug one side of this trattoria, while traditional tables for two to four people line the other. We could have dined solely on the antipasto plate offered here, with olives, sun-dried tomatoes, a couple of thin slices of Parmesan Reggiano, marinated mushrooms and artichoke hearts, thin slices of Parma ham and carpaccio, and rolls and breadsticks with olive oil and balsamic vinegar for dipping. The meat dish (veal) was impressive, too, but even better was the perfectly al dente side of linguini carbonara that we chose. The restaurant bakes its own pies in a large pizza oven, but you won't find American standards like pepperoni. Choose from pizza selections such as pepperoncino, with mozzarella, beef strips and garlic; and Bolognese, with mozzarella, roma tomatoes and Bolognese sauce. If you have room, finish it off with the rhubarb panna cotta, which features peach and grape chutney in a vanilla reduction. A meal for two (appetizer to share, two entrees and two desserts, with a glass of wine and a cocktail, including the auto-gratuity) came to about $73. 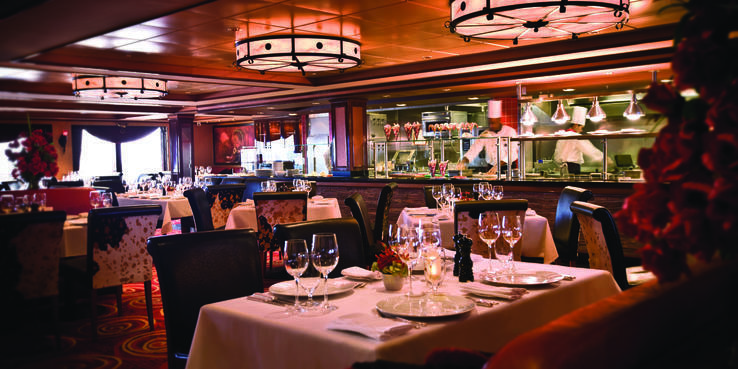 Cagney's Steakhouse (Deck 13); a la carte pricing: Cagney's, Norwegian's signature steak and chophouse, features an open kitchen, horse paintings and red rose lights that give off a romantic feel as you dine on some heavy-duty steak. Start with the lump crab salad or the split pea soup before making your way to cuts of meat that range from an 18 oz. bone-in ribeye to an 8 oz. gorgonzola-crusted filet mignon. Make your side dish the truffle fries, and if you still have room, try the raspberry creme brulee for dessert. Starters range from $4 to $8, soups and salads are $3 to $5, specialties start at $16 for a double-cut pork chop and surf and turf (lobster tail and 5-ounce filet mignon) is $25. Sides like sauteed broccoli, truffle mashed potatoes (or fries) and onion rings all run $2 each. Seafood includes a tuna steak ($17) and whole cold-water Maine lobster ($25). Room Service; $7.95, except Continental breakfast: Room service on Norwegian has a flat $7.95 service charge per order (so make sure everyone in your party orders at the same time). Exceptions to the fee are for suite passengers or those ordering a Continental breakfast -- consisting of fruit, yogurt and cereal -- between 6:30 a.m. and 10 a.m. (Indicate if you are interested in such a breakfast by hanging a card with your order on your cabin door the night before.) Available menu items for a fee include omelets and French toast for breakfast; chicken noodle soup, Cobb salad, cheese plate, 11-inch pizzas, BLT or cheeseburger for lunch. For dinner, try grilled salmon, spaghetti Bolognese or Argentine skirt steak. Desserts include New York cheesecake, strawberry pound cake and chocolate cake.